The machine-made decanter distinguishes by an elegant and complex design. 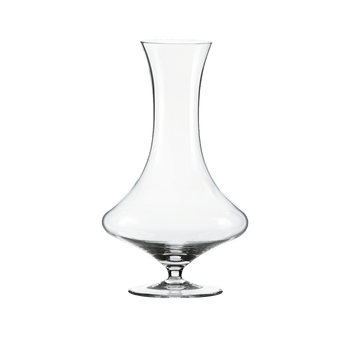 The Apple NY decanter, with its small footprint, its roomy body and thin neck, bears a remarkable similarity to the well-known and much-loved fruit and gives every interior a special and elegant touch. The decanter is small enough to fit into a standard fridge or dishwasher and is equally suitable for an informal evening meal or a large formal dinner – ideal for every day and for any occasion. RIEDEL whole-heartedly believes all wines - young and old, red, white or sparkling - can be enhanced by decanting. RIEDEL tip: use bottle cleaners to remove stains inside the decanter.